The therapists at ARC are specialized in manual therapy and use joint mobilization to realign the TMJ and relieve the direct stress on the TMJ and it's meniscus. TMJ stands for temporo-mandibular-joint, which are the right and left jaw joints. These joints serve as hinges between the lower jaw and the skull, allowing free movement for chewing, speech, etc. TMJ problems are characterized by pain, popping, and clicking in the area of the Temporo-Mandibular Joints, just in front of the ears. 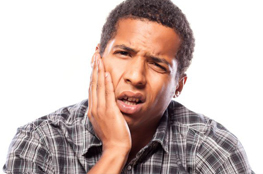 Problems with the TMJ’s can arise from stress, tooth grinding, misalignment of the TMJ and uneven bites causing undue strain to muscles controlling the TMJ. This chronic overuse of the muscles that control the TMJ results in muscle guarding and muscle tightness, which will impede the blood flow, and therefore restrict access to nutrition and oxygen necessary for healing. In turn this will lead to a vicious circle of even more muscle guarding, tightness and pain, and eventually to chronic headaches of all kinds, migraines, jaw, neck and earaches. Symptoms of TMJ disorder can include pain or tenderness in your jaw and around the ear, difficulty or pain while chewing, and locking of the joint, making it difficult to open or close your mouth. TMJ won’t necessarily result in pain. It can just be a clicking sound, or a grating sensation when you move your jaw. Before you let the pain of TMJ rule your life, make sure you get some help. Anti-inflammatory medications are often used to help control pain and inflammation. Another option is a steroid (cortisone) injection, but if a person has tried more than two cortisone injections without relief, it is unlikely that additional injections will benefit the patient. Surgery to release the damaged meniscus may be needed in a small percentage of patients. Since much of muscle pain stems from strain, lactic acid build up, scar tissue, etc. as a result of muscle tightness and or inflammation, the treatment consequently involves controlling muscle stress and reduction of the inflammation. The therapists at ARC use physical therapy, soft tissue mobilization, massage, medical acupuncture and various modalities like ultrasound and infrared lamps, all directed to increase the blood flow of the tight muscles, and hereby starting the healing process by providing access of nutrition and oxygen to the injured area. This increase of blood and lymph fluid circulation increases muscle metabolism and gets rid of lactic acid to relieve pain. The therapists at ARC are specialized in manual therapy and use joint mobilization to realign the TMJ and relieve the direct stress on the TMJ and it's meniscus. ARC also provides a gentle stretching and strengthening program to both the muscles and connective tissues that surround the TMJ muscles. Early treatment is very important and cannot be overstated. TMJ problems can advance in stages and grow progressively worse. Thus, a minor problem now could become a major source of pain in the future. Additionally, chances of successful therapy increase substantially the earlier treatment is accomplished.